Learning a new language, playing an intricate piece on a musical instrument, hiking a new nature trail, aiming to beat your own record swimming, building something, or learning to dance, can all prime flow. For each of us, there are thousands of potential challenges, opportunities, and ways in which we can expand ourselves, and move toward thriving. At home, work, play, sport and exercise, our focused attention and commitment are important tools for improving our experience. By directing our attention and concentration on the mission at hand, we are more likely to achieve the heightened optimal Flow state of inner experience. Flow occurs when our psychic energy, or attention, is invested in realistic, but challenging goals, and when our skills match those opportunities for action. Our challenges, determination, skills, and passions align. In his classic text, Flow, The Psychology of Optimal Experience, Mihaly Csikszentmihalyi, reveals flow experiences are genuinely satisfying and gratifying. In flow, people feel moments of concentration and deep enjoyment. There is harmony. When we experience flow, our present time experiences seem more enriching, and we often lose track of the time. A few years ago, I dedicated myself to training for the 26.2 mile, Dublin Marathon as a benefit for the Arthritis Foundation. The training was grueling and I vowed to challenge myself, but didn’t want to risk an injury or burn out. I decided to race walk and run the event, with a goal of “dancing through the finish line.” This realistic, but challenging goal, with the support of encouraging teammates, was just what I needed. I trained smart, listened to my body, reached my goal, and gratefully, found flow. Flow states give us an opportunity to develop skills optimally, and empower us to make significant contributions elevating our performance, our team, and/or our personal well-being. Engaging in sport, music, art, the outdoors, and especially movement classes like yoga, dance, dance/fitness, strength training, and tai chi, can help lead us to flow, and provide excellent health benefits, especially in lowering the risk of non-communicable diseases: cardiovascular, diabetes, kidney, cognitive, pulmonary lung disease, cancer, obesity, and depression/loneliness. Enjoyable and meaningful physical activities can improve our whole health, fitness, and performance. 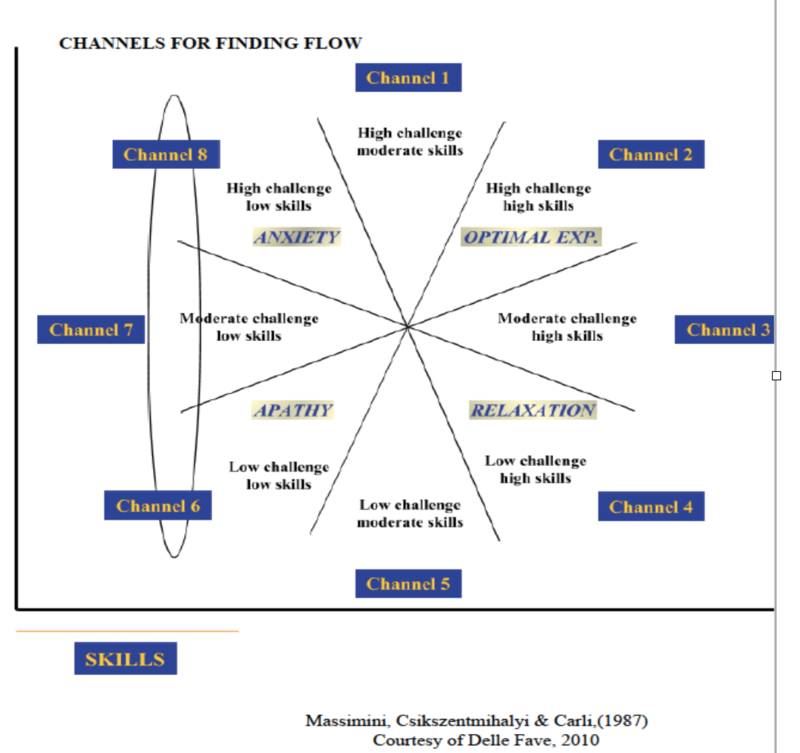 Below is the flow channel from Dr. Antonella Delle Fave, M.D., demonstrating high challenge and high skill levels promote a “sweet spot” of optimal experiences, leading us toward Flow. It is THE right amount of challenge in relation to our skill set. When we take on something that is too easy, it is a low challenge and high skill condition; this can lead to apathy and boredom. If the challenge is too difficult, and our skills are not in alignment, this can cause us anxiety and distress. I knew I would not be willing or able to train to ‘win’ the Dublin Marathon, but prepared and trained so I could complete it, and meet my goals: to have a good Marathon experience, to “dance” across the finish line, and to use my healthy body to help others. These intentions applied with awareness and action, led me to feelings of flow, and the thrill of a lifetime. 1. Be more mindfully Aware. As an example, start with your posture: Crown of the head to the sky, tall neck, lift up your rib cage and your heart, shoulders down, abdominals pulled in and up, hips square, softness through the knees, and good foot placement; a posture check allows us to breathe, move, function more optimally, and raise our attention. Breathe, and move with confidence. 2. Take Action. Listen to, and love your body. Your body needs fuel, movement, stimulation, time in nature, and rest. Start where you are. Be true to yourself, setting realistic but challenging goals to help you boost your health, performance, and success. I wasn’t overwhelmed by running a marathon because there was a realistic chance I could complete it. Taking action upon achievable, but challenging, goals helped me to build progression across my training, and pay attention to my body’s cue. I was able to use my healthy body to achieve my dream, and feel joy because I was helping people with arthritis at the same time. 3. Be more Aerobic. Get up and move your arms and legs. Research demonstrates physical experiences, especially rhythmic movements, like in dance, help generate flow. 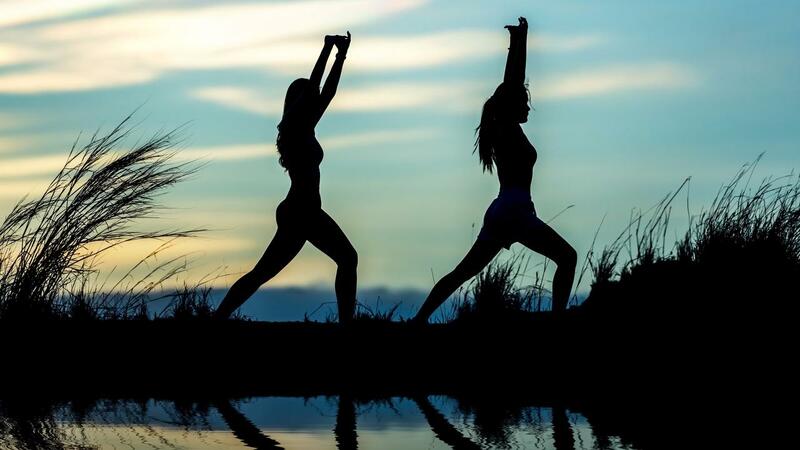 Aerobic activities, like brisk walking, dancing, swimming, using our large muscle groups continuously and rhythmically, are a key to cardiovascular health, fitness, and positive energy. 4. Who are your Allies? – People matter. Research shows that Co-Active Flow and Social Flow with others, actually heightens flow experiences. In certain groups, we experience shared positive emotions; when these good feelings are amplified, they have the potential to move us toward companionability, excellence and more joy. In a group, mirror flourishing, a positive state where we when we actively engage with another, can help us move to greater fulfillment. 5. Appreciation. Grace and gratitude have a profoundly positive effect on our wellbeing. Think of ways you can use your healthy body to help and inspire yourself and others. Join in a community walk, participate in an active fundraiser, a neighborhood clean up, a school dance. Savor your experiences, feel transformed giving and receiving goodness, and celebrate the present. 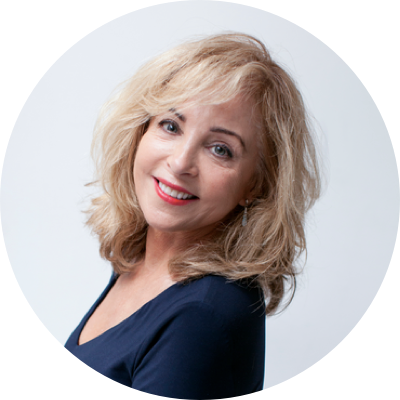 Elaine O’Brien, PhD, MAPP is a Fitness Scientist, Educator, Trainer, Speaker, and Innovator exploring the art and science of Exercise Psychology, Motivation, Performance, Connections, and Positive Sports Medicine. With a Masters of Applied Positive Psychology, Dr. O'Brien strives to help people enjoy moving well, more and meaningfully, encouraging that exercise shouldn't hurt, and can be empowering, rewarding, as well as fun!